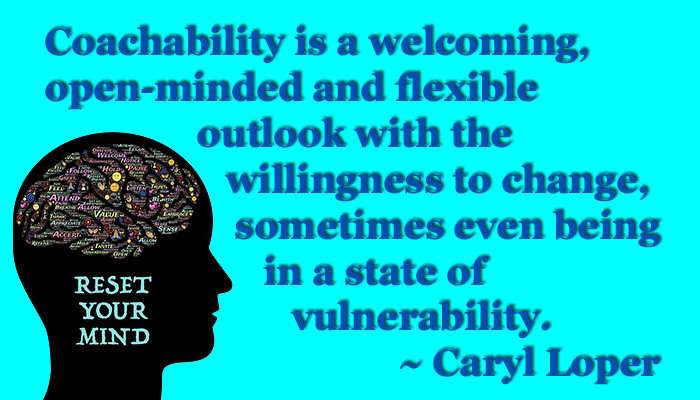 Coachability is a welcoming, open-minded and flexible outlook with the willingness to change, sometimes even being in a state of vulnerability. Transformations only happen through the shifting of our thoughts, habits, behaviors, and actions. To achieve a level of change it goes well beyond the complexity of our intellect and brain power. Often when we intellectualize, we tend to judge by comparisons whether it is judgments of our past performances or other people’s abilities. Allowing a level of openness is the best way to manifest growth. After all, if we get stuck in a narrow-minded mindset, we then close off the possibility of a great opportunity. That may set up roadblocks, and stop us in our tracks. Movement even if the steps appear miniscule is better than no movement. You can always course correct along the way. Become an active listener. When someone is an active listener, it opens them up to possibilities. When working with a coach, the main focus is on the coach‘s information, knowledge and insights. It is a shift in mindfulness and awareness. Go beyond the surface. Information when only absorbed as facts is less likely to be put into action. It is only data. When we go to the depths of revelation, that AHA moment, change occurs. When we place it into action, it shifts from information to knowledge to wisdom to potential success. Aspire openness and flexibility. Think outside the box. Stretch yourself out of your comfort zone. Some avoid new information for the fear of change. They resist simply because they view it as a loss of control rather than an incredible experience of self-empowerment. Let go of negative thought patterns. Release the old paradigm. Change your thoughts. Learn new behaviors and actions. Remember, it is more than changing the old paradigm. It takes active involvement, persistency and consistency. range of emotions and feelings, joy and happiness OR sadness, disappointment, and anger, to name a few. We can choose to work though the range of challenging emotions. Move those emotions to release, relief, security and peace. We can choose suffering or relief. The choice is ours. When we choose suffering we are choosing to stay in constant pain. We can elect positive thinking. Time is of the essence is an old adage. Time hinges on such aspects as organization, detail, focus, and attention. The manner in which we coordinate those aspects will keep us afloat. What we choose to do with our time will pave our way to success. Communication is the core to success. With active listening, communication naturally lends to a relationship of validation, acceptance, understanding and empathy. When we are active listeners, whether in personal relationships or as business builders, we foster a place of positive interactions. Lead by example. Walk your talk. Be forthright with your convictions, consistent with your values, passionate about your vision, mission and love of life and people. Leading by example validates your authenticity and respect for life. Be a relationship builder. Be the connector that brings people together. Relationship building at the heart is all about giving. When giving is your primary value, your worth and significance becomes your asset to success. Remember to resonate to your own music. Hear your inner self, your inner beat. Reach deep within your heart, feel life’s zest and passion for why you are placed here. After all, it is your birthright! Looking for a coach? Check out Gary’s coaching program. Gary’s personal and business coaching does not focus on “why,” but on “what now?” His coaching process shifts obstacles into plans and goals, looking forward instead of analyzing the past. His training is to listen, observe and customize an approach to tailor to your needs. He will find solutions and strategies that will help you get out of your rut. Coaching programs are personalized to meet you where you are. Just looking for a strategy call? Check out his 30-minute strategy session call for only $25, $100 value.